If there is one tool around which the modern woodworking shop should be centered, it is the table saw. Likely to be the biggest tool purchase a woodworker will make, it is the one tool on which the woodworker should spend as much as they can afford. Here are a number of tips and tricks for getting the most out of your table saw. Cutting on a Table Saw. The table saw is typically thought of as the workhorse of the woodshop, as it is likely the most versatile and productive of all woodworking machines. This one tool can rip, cross-cut, miter-cut, square, dado, rabbet, and even apply shapes to edges of wood stock. Learn the features one should consider when choosing the most important woodworking tool in the shop. While the table saw is likely the workhorse of the woodshop, according to statistics, it is probably also the most dangerous. A table saw can be very unforgiving, as many a woodworker has lost a finger, hand or worse to this tool. By following a few common-sense rules, though, you can safely use your table saw and greatly reduce the chance of injury. 49th Force Support Squadron Wood Shop supervisor, measures a board of redwood at Holloman Air Force Base, N.M. 23 Aug. 2016. Keeping your table saw operating smoothly requires some regular maintenance. A properly-tuned table saw will cut easily and smoothly, whereas a saw that is improperly tuned can bind and actually be far more dangerous to operate. With a few basic steps, you can tune your table saw to keep it cutting smoothly, cleanly and most important, safely. Don Lindsly, woodworker, helps do-it-yourselfer Master Sgt. Wylie Parker, measure a piece of hardwood before cutting it on a circular table saw at the woodshop. A quality, well-built table saw is most often equipped with a table built from cast-iron. While the weight of the cast-iron table helps the saw's stability, the bare cast-iron is prone to rust, which can discolor wood and make using the tool more difficult. Fortunately, you can protect your saw's table by following these basic tips. Top left: disassembled stacked dado set showing blades and chippers; bottom left: stacked dado set in table saw; right: wobble dado set in table saw. Cutting dadoes and rabbets are tasks typically reserved for the table saw. There are two predominant types of dado blades, either a set of stacked dado blades or a single blade set to a specific angle on an adjustable arbor (commonly called a wobble dado blade). Learn the advantages of the stacked dado blade set over a wobble blade, and how to safely use a stacked dado blade set on your table saw. 8" 24T Dado Circular Saw Blade Set. Some table-top or smaller portable table saws have too short of an arbor to use a complete set of stacked dado blades. However, you can still safely use your stacked dado blade set even with a short-arbored table saw. Learn how in this woodworking tip. Incra I-BOX - Box Joint Jig For Table Saw & Router Table. 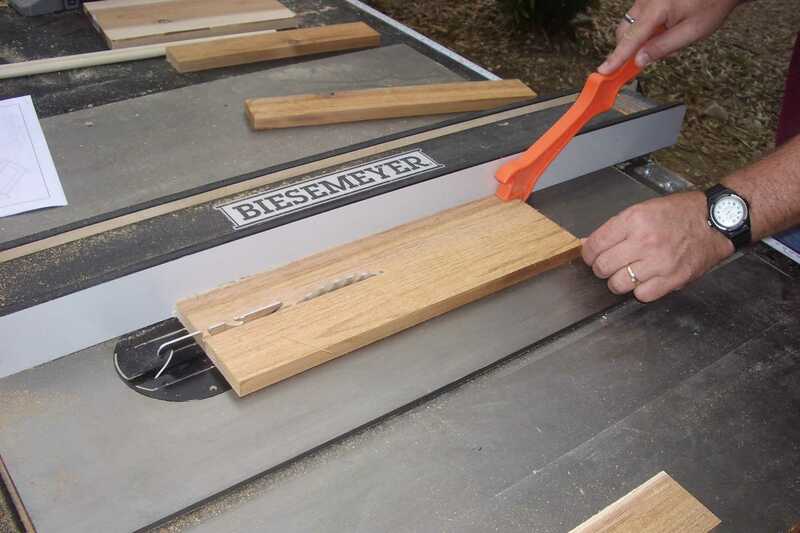 The jointer is commonly regarded as the best choice for straightening an edge of a board. However, it is a bit of a specialty tool that doesn't have a lot of other uses. What do you do if you don't have a jointer? Try building a table saw jointer jig with these free woodworking plans. This jig can be used to straighten the edges of a variety of sizes of boards using nothing more than your table saw. Rockler Router Table Box Joint Jig. Box joints are sometimes considered as a poor step-sister to dovetail joints, but that is giving the box joint a bum rap. Sure, a common through dovetail joint is a more sturdy joint than a box joint, but it is far more difficult joint to create. A box joint can be cut using a simple jig with your table saw. A number of woodworking projects for furniture such as tables or chairs require tapered legs. Where traditionally tapered legs would have been cut by hand, the simplest and most accurate method is to use your table saw with an adjustable tapering jig. This jig can be easily built in your woodshop​ and can be adjusted and locked in place to any angle between 0-15 degrees. Learn how in these step-by-step woodworking plans.